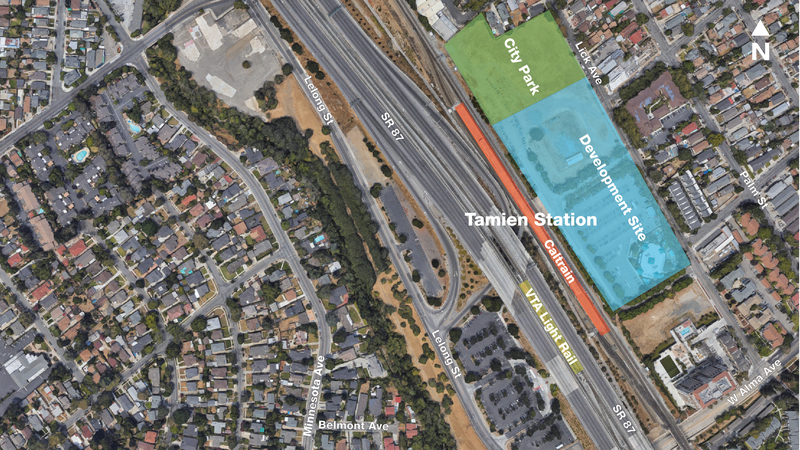 VTA has partnered with a developer, UrbanCo-Tamien LLC, a partnership between CORE Development and Republic Urban, to develop 6.96 acres of property located near the Tamien VTA Light Rail and Caltrain stations. This site is east of Highway 87, between the Willow Glen and Alma neighborhoods, about 10 blocks from downtown San Jose. UrbanCo-Tamien LLC will build both a 440 unit residential community on the east side of the property in addition to parking for VTA and Caltrain customers onsite. The zoning permits the residential development to construct up to 440 units of multifamily housing, and 3,000 square feet of commercial retail space. Per VTA’s Joint Development Policy, the residential component of this development will be required to contain a minimum of 20% of residential units that are affordable to low income households (earning 60% or less of Area Median Income “AMI”) with half of those units affordable to very low or extremely low income households (earning 50% AMI or lower). 2/1/19: Weather and conditions permitting, construction activities (soil testing) will take place in the northwest portion of the dirt lot. Parking will be restricted on February 4, 13, and 14. You can continue to help to shape this future development! VTA's developer partner, UrbanCo-Tamien LLC, has submitted a Project-Zoning Application to the City of San Jose Planning Department. This would allow up to 569 residential units and up to 3000 square feet of commercial space on an approximately 6.96-acre site. The City held a Community Meeting on December 17, 2018, at the San Jose Elks's Lodge on Alma Avenue. The City's meeting notice with city contact information is available, and additional information about the zoning application can be reviewed Monday-Friday, 9am-12n, and 1-5pm in the Planning Division at City Hall, 200 E. Santa Clara Street, 3rd Floor Tower, San Jose - File No. PDC18-025. VTA’s Joint Development Program works with municipal and private partners to encourage the development of housing, retail, and employment centers in places that will help increase transit ridership and contribute to a vibrant community. Among VTA’s Joint Development requirements is that 20% of housing on a particular site must be affordable.